Ideally located 5 minutes walk away from Khao Sarn Road and Banglamphu shopping area of Bangkok, where banks, restaurants and night markets line the street. 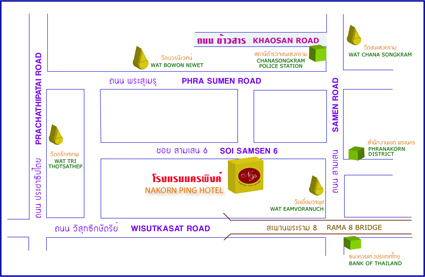 Santichaiprakran Park - by the Chao Praya River is at our doorstep. Easy access to all types of transportations: taxi, bus, train and ferry. The international and Domestic Airports are only a 45 minutes drive from the Hotel. The nearby Sanam Luang, next to the Grand Palace, central bus stops of many bus lines give our guests direct and quick access to the Weekend Market, various major Palaces and Temples and other major tourist attractions within and beyond the City of Angels. Copyright © 2007 Nakorn Ping Hotel. All Right Reserved.